We had one of the best holidays staying at Ruskin's View. The property is stunning and finished to a fantastic level. Everything you could want was ready to hand including a hamper of local produce to kick start the holiday. The owners are so friendly and welcoming and finished off the perfect holiday rental. Kirkby Lonsdale is a little gem too. We'll definitely have to come again! We stayed in Ruskin's view for 5 nights. A really friendly welcome (plus pack) when we got there and we were delighted with the location and quality of the accommodation. Lovely and peaceful while literally being in the middle of Kirkby Lonsdale - a beautiful town with plenty of excellent eateries (make sure you're hungry before you go to the Bakers for breakfast!!) and interesting shops. And we were next door to the stunning Ruskin's view. Beautiful. Would love to go back to sample more of the area and would definitely books this cottage again. Thank you Neil and Gill. We had a wonderful stay at Ruskins View Cottage towards the end of February. 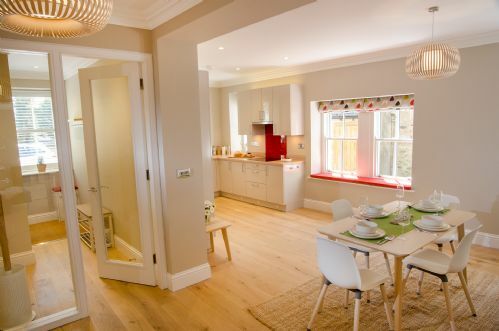 The finish is excellent and thought has gone into every room, the kitchen had everything we needed to cook & bake. The location is great, hidden away but a stones throw from the centre of town. A beautiful cottage, thank you! Wow Wow Wow! What a fantastic cottage. Everything about Ruskins View is 5 * - the facilities, the location, the views. The owners are friendly & helpful & left us a wonderful welcome hamper. The cottage is tastefully decorated throughout & they have literally thought of everything. Hot tub is such a lovely touch. What a find Ruskins view was. Without doubt one of the best locations, not only for visiting local towns and villages but also the views were amazing. The town of Kirkby Lonsdale has everything to offer, from great eateries and pubs to small quaint shops. The Cottage itself is outstanding, from everything you could ever need in a kitchen, to comfy beds, underfloor heating and a fab hot tub. We will defiantly be back to stay again. My wife and I have visited and stayed in Kirkby Lonsdale many times but this place is hands down the best yet. Amazing views, tons of space, high quality throughout and super clean. On top of that there’s a hot tub, parking and a generous welcome. Can’t wait to come back. Ruskin view cottage saved a very wet long weekend. Everything about the property was excellent. To be able to wake up to the view at the back of the property was truly uplifting but then to be able to access the town and all its amenities within a minute's walk was the icing on the cake. Neil and Gill had put such thought into this property. Not a single item had been missed in making your stay much more than a home from home. And what a home. If you wanted to take a picnic there was a beautiful hamper and a waterproofed blanket for your excursion. If you wanted to stay in and avoid the distraction of the television then there were games aplenty. However if, like my husband, you found yourself gripped by Netflix and 'The Crown' there was entertainment every evening. The welcome hamper was so generous that we cursed ourselves for bringing so much food. If you turned up without your own provisions then I feel sure you could manage for one night with what was provided. But with so many great shops within walking distance you could feed the five thousand after a 30 minute walk around. We had a brilliant family holiday at Ruskins View. Standard of house and what is provided is excellent. It sits in a beautiful location a stones through away from shops, pubs and restaurants and has the added bonus of a hot tub. Would definately love to go back and would highly recommend. My husband and I had a short stay. Definitely putting it on our return list. 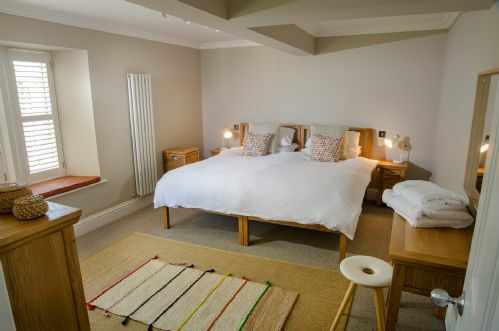 Perfect for a relaxing stay or going further afield. Welcome pack was wonderful and catered for my coeliac needs. Restaurants in the village recommended also.in all a top class let. Ruskin’s view cottage is a luxurious place to stay for a break in the Lake District. We were lucky enough to be one of the first people to stay there and we absolutely loved it! The property has been renovated to the highest standard and is in a brilliant location in the beautiful town of Kirkby Lonsdale. 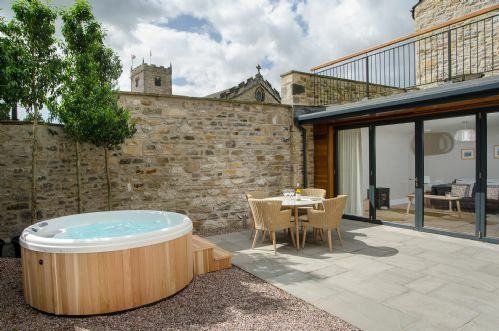 The hot tub is in a private courtyard and there is a nice roof terrace overlooking the church and grounds which gets the evening sun. Neil and Gill kindly left some food and refreshments for us on arrival which was a nice touch, and Neil was on hand and attentive to any queries we had. 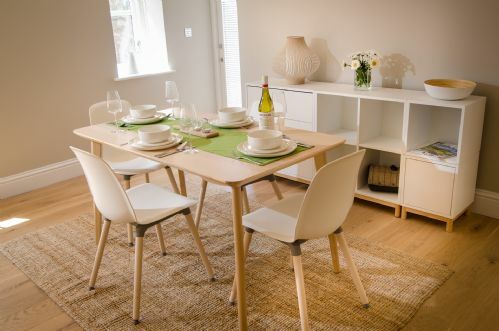 Ruskins view cottage is great - you won’t regret booking it! Cannot praise this cottage highly enough. Located in the middle of town , although you wouldn't know it, hidden away behind a secure gate with idyllic views from the driveway. Secluded courtyard with hot tub and patio furniture . Everything is to the highest standard. Within an easy car drive of the lakes. Loads to see and do. Also walks around the town itself. This was our first holiday with our 9 month old daughter. The property is very modern and open plan. Plenty of space for here to play. The location is perfect and we couldn’t have asked for better weather. The hot tub is also nice for relaxing in. Booking was very easy and the information and details supplied were very useful. We will definatly be returning and hopefully booking the property in France for our holiday next year.